The scientific principle of “mechanical springs” was described by the British physicist Robert Hooke in the 1660’s. Since then, there has not been any further development of the Hooke’s law in the electric regime. In this paper, this technological gap is filled by the development of “electric springs.” The scientific principle, the operating modes, the limitations, and the practical realization of the electric springs are reported. It is discovered that such novel concept has huge potential in stabilizing future power systems with substantial penetration of intermittent renewable energy sources. This concept has been successfully demonstrated in a practical power system setup fed by an ac power source with a fluctuating wind energy source. The electric spring is found to be effective in regulating the mains voltage despite the fluctuation caused by the intermittent nature of wind power. Electric appliances with the electric springs embedded can be turned into a new generation of smart loads, which have their power demand following the power generation profile. It is envisaged that electric springs, when distributed over the power grid, will offer a new form of power system stability solution that is independent of information and communication technology. Fig. 1. The experimental setup for the electric spring (with control block diagram). Fig. 4. 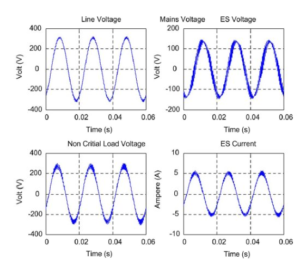 Measured steady-state electric spring waveforms under “inductive” mode. Va=94.3vac QES=348.4 var. Fig. 8. 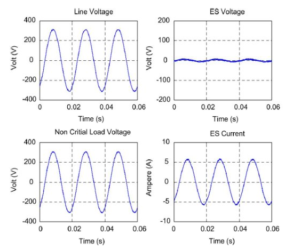 Measured power of the critical load and smart load. [Electric spring is programmed for both voltage boosting and suppression functions.]. The Hooke’s law on mechanical springs has been developed into an electric spring concept with new scientific applications for modern society. The scientific principles, operating modes and limits of the electric spring are explained. 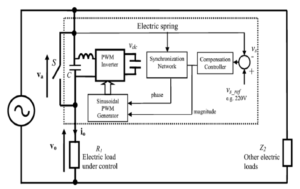 An electric spring has been practically tested for both voltage support and suppression, and for shaping load demand (of about 2.5 kW) to follow the fluctuating wind power profile in a 10 kVA power system fed by an ac power source and a wind power simulator. The electric springs can be incorporated into many existing noncritical electric loads such as water heaters and road lighting systems  to form a new generation of smart loads that are adaptive to the power grid. If many noncritical loads are equipped with such electric springs and distributed over the power grid, these electric springs (similar to the spring array in Fig. 1) will provide a highly reliable and effective solution for distributed energy storage, voltage regulation and damping functions for future power systems. Such stability measures are also independent of information and communication technology (ICT). This discovery based on the three-century-old Hooke’s law offers a practical solution to the new control paradigm that the load demand should follow the power generation in future power grid with substantial renewable energy sources. 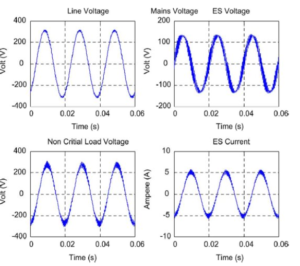 Unlike traditional reactive power compensation methods, electric springs offer both reactive power compensation and real power variation in the noncritical loads. With many countries determined to de-carbonize electric power generation for reducing global warming by increasing renewable energy up to 20% of the total electrical power output by 2020 –, electric spring is a novel concept that enables human society to use renewable energy as nature provides. The Hooke’s law developed in the 17th century has laid down the foundation for stability control of renewable power systems in the 21st century. A. M. Wahl, Mechanical Springs, 2nd ed. New York: McGraw-Hill, 1963. W. S. Slaughter, The Linearized Theory of Elasticity. Boston, MA: Birkhauser, 2002. K. Symon, Mechanics. ISBN 0-201-07392-7. Reading, MA: Addison- Wesley, Reading,1971. R. Hooke, De Potentia Restitutiva, or of Spring Explaining the Power of Springing Bodies. London, U.K.: John Martyn, vol. 1678, p. 23. K. Symon, Mechanics. ISBN 0-201-07392-7. Reading, MA: Addison- Wesley, Reading,1971. R. Hooke, De Potentia Restitutiva, or of Spring Explaining the Power of Springing Bodies. London, U.K.: John Martyn, vol. 1678, p. 23.